Who doesn't like to watch two kangaroos battle it out? I know I do! These two kangaroos face off with moves that resemble human hand-to-hand combat. Apparently Things can get downright deadly when male kangaroos fight over mating rights. With their gigantic feet, these "boomers" deliver kicks that can crush bone. They can even kill their opponents with a swift kick, that's how strong they are. Luckily that doesn't happen in this clip. If you ever encounter a live kangaroo fight, stay far away! As always, click on the link below and enjoy! 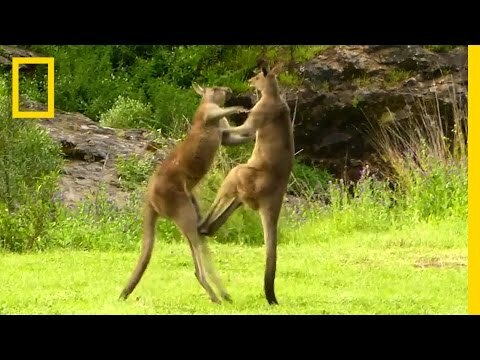 Two Kangaroos battle it out! Monkey dressed as a cowboy herds sheep while riding a dog!